Drink Down? | Mediterra - Swim & Run Better Than Ever! I wrote the essay Drink Up! recently describing the importance of adequate hydration to maintain mental as well as physical performance – I cited medical observations by Dr. Kenneth Kamler in his book “Surviving The Extremes.” It is important to point out the context of his book: humans surviving in extreme environments. Now, the definition of ‘extreme’ is going vary according to the perspective of the person thinking about it. In Kamler’s book extreme refers to environments and physical conditions where the survival systems of even the most amazing human specimens start to fail. To the arm-chair sports spectator, walking down the street to buy beer at the corner store in 35 C (95 F) heat may feel ‘extreme’ and in some cases could actually be life-threatening. Among swimmers a 2+ hour swim may seem ‘extreme’ to some, while that is a mere warm-up set for others. Absolute extreme is that which pushes humans, even a superb specimens, to their known limits. Relative extreme is anything you and I are not prepared by our training to do safely. And so, relative extreme is what you and I need to be concerned about in our hydration planning. Adequate hydration and mineral balance depends on where you are starting at and where you are going. Coincidentally, there is some buzz this summer about over-hydration (hyponatremia) as a suspect in some cases of death in hot-weather sports. Here is are recent blog post in the New York Times – For Athletes, the Risk of Too Much Water. Perhaps you have heard of the warnings against the ‘8 Glasses Of Water A Day’ recommendation like this one also in the NYT (obviously a trend in that newspaper). And then there is the sports training powerhouse Dr. Timothy Noakes in his book Waterlogged: The Serious Problem of Overhydration in Endurance Sports. So, what’s the real danger? Too much fluids or too little? It depends on what the activity will subject the body to, where the person is starting from, and what correction one is trying to make. The short answer to all this is that we want to achieve an optimal state of hydration on one hand, while also training our bodies to keep performing under the metabolic stresses that can occur in our chosen sport challenges. It is a normal part of practice and racing that our resources are being used up, and we can go only so far before they need to be replenished. We need to avoid the dangerous extremes of both too little and too much, which begin to be destructive to our bodies, while still remaining adaptable to a range of stresses that are a normal part of those sports. That goal is easily understood and agreed upon. But determining where each person is at on the scale and then coming up with an appropriate hydration plan takes some thinking and practice. That’s where the advice of someone like Dr. Noakes may come in handy. There is an important distinction to make about ‘danger’ and hydration. There is optimal, there is tolerable, and then there is dangerous. 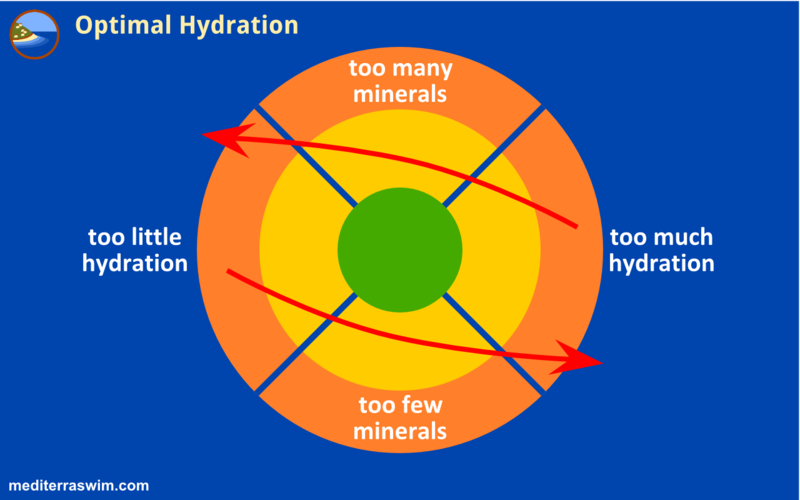 There is an optimal zone (GREEN) where the body is supplied enough water and minerals to function at its trained best. This is what we aim for. Then there is a zone where our water and minerals fluctuate from the anticipated stress of work and sports training (YELLOW). We can and should be able to function in this zone. And we should learn to detect that we are in this less-than-optimal zone so that we can correct our imbalances at the next opportune moment. This is what we train for. And then there is this danger zone where systems in our body are starting to fail (ORANGE). This is what we train to prevent. Our hydration plans needs to fix one extreme while not going so far as to drive us into another. Makes sense, doesn’t it? In this diagram, you can see two red arrows which represent the generic advice that urges everyone to ‘Drink 8 glasses’ or ‘Don’t drink more than 2’ or, ‘Don’t worry, you get enough in the foods you eat and coffee you drink”. Advice like this cannot be generic to everyone because it does not take into account each athlete’s position relative to the optimal zone. So, do you need to drink 1 glass water today or 8? Do you need plain water, or take the colored performance drink? Good question! It is one you have to answer yourself, and ask/answer again on each new day with new conditions you will find yourself in. In that previous blog post I described my approach to keeping my hydration and minerals aimed at the optimal zone and it’s been working well for me for several years of endurance swimming and running. There is room for improvement, I am sure, and I will keep trying to improve it. I encourage you to study and develop your own.